Japan have long held the desire to be the global leader in floating wind farms, however, their status as the best is coming under increased pressure from Europe. The increased pressure has come about since governments and related companies are determined to lower the costs and show that wind farms have the capability to match other sources of clean and renewable energy. At the center of Japan’s effort is a demonstration project off the coast of Fukushima north of Tokyo. 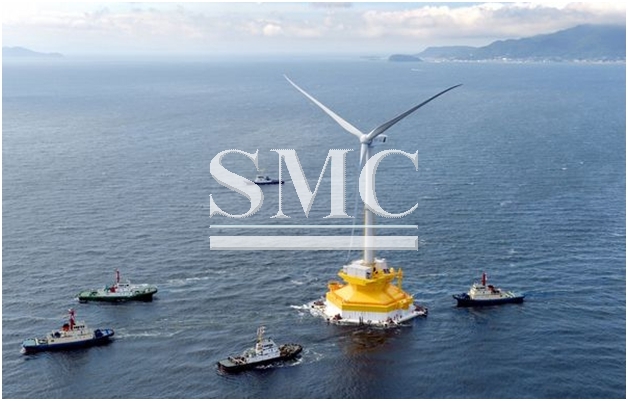 The largest floating turbine project of its kind at the moment consists of a 2-megawatt turbine, a 7-megawatt turbine, a substation, and a 5-megawatt model, which was towed into place last month and is expected to begin generating power soon. The project, funded by Japan’s Ministry of Economy, Trade and Industry, is being developed by a 10-member consortium including Mitsubishi Heavy Industries Ltd. and Hitachi Ltd. One of the goals is to show whether floating offshore wind can be commercially viable. One of Japan’s biggest problems when it comes to floating wind turbines is their relative lack of experience in comparison to their European counterparts. Europe has for long been involved in oil and gas developments which would have enhanced their knowledge of seaborne construction, whereas this is a relatively new area for Japan, therefore making costs higher than necessary. That’s not easy for a project that’s testing various technologies for the first time. The 7-megawatt turbine supplied by Mitsubishi Heavy, which deploys a hydraulic drive train instead of mechanical gears, is expected to restart in January after tests led to extra construction work. Globally, investment in floating offshore wind was a fraction of that for turbines fixed to the bottom of the sea. The floating offshore market is valued at $490 million to date, including both demonstration projects and a commercial venture off the coast of Scotland that’s yet to produce power. That compares with $113.4 billion invested in traditional offshore wind farms with concrete foundations on the bottom of the seabed, according to data compiled by Bloomberg New Energy Finance. Japan’s trade and industry ministry has so far set aside $499 million for the Fukushima project, which is now in its fifth year. Unlike a lot of countries, Japan is not rich with resource and therefore is heavily reliant on imports, which is obviously costly. Meaning that although they are likely to suffer the burden of heavy initial investments, the floating wind turbines will have be of economic benefit in the long term. • The world’s first floating substation, set up to increase transmission efficiency, has been trouble-free since its installation in 2013, said Takeshi Ishihara, a professor at the University of Tokyo who has been leading the project. • A V-shaped design has been shown to reduce the number of components needed for the floating structure on which a turbine is installed, allowing for a 40 percent reduction in cost a megawatt, according to Ishihara. • A winch fixed to the floater to pull up mooring chains eliminates the need to deploy a crane, boosting work efficiency and safety, according to the professor.